Information: Emil Kolev (1931-2002), well-known Bulgarian accordionist, composer, and arranger. Emil was born in the village of Banitsa, near Vratsa, North Bulgaria, Kolev was a graduate of the Bulgarian State Conservatory. He started out as a rehearsal accompanist at the State Choreography School in the mid-fifties and later became a soloist for the Bulgarian National TV and radio. 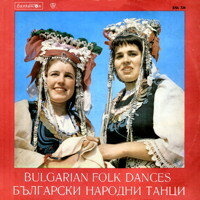 He was a featured master accordion player on many Balkanton recordings and he also supervised orchestral arrangements for many Bulgarian folk singers (especially West Bulgarian and Macedonian singers) such as Lyuben Bozhkov, Gancho Nikolov, Kostadin Gugov, Pavlina Gorčeva, Valentina Despotova, Vassil Videnov, Slavka Sakutova, etc. For a few years he directed the famous Sofia Šopski Ansambl. He also toured with various groups throughout Europe, Asia, and Africa. I was fortunate to have known him since 1969. He was a kind person with a profound respect and knowledge of Bulgarian folk traditions. He also loved to sing and dance. His orchestra played for several selections on my "Red Album" which was recorded in 1970 (Balkanton 734) and more recently on the CD Ajde na Horo (GEGA 134) supervised by Jaap Leegwater and myself in 1991. Emil is not related to Kosta Kolev, another famous folk accordionist and arranger. Emil passed away in Sofia after suffering a heart failure. He was 71.